Required: Destination. If you do not find a desired hotel, please come back and search again. Hotels are continuously updated. Easy-to-use website allows you to search and compare fares. Travel services in the US, Europe, and Asia. Dedicated customer service staff and secure online ordering. * Prices are per room/unit and do not include taxes and service fees. This hotel is conveniently located just a short driving distance away from the bright lights and attractions that Manhattan has to offer. The hotel enjoys ease of access to all major highways serving the city, as well as many Fortune 500 companies. Guests can spend a day at historical Morristown, or Turtle Back Zoo. The nearby Mountain Creek Ski Resort offers fun for guests of all ages. This wonderful hotel comprises elegantly-appointed guest rooms, which offer a haven in which to escape the bustle of the city. Providing a wide range of facilities and services, this hotel ensures guests will enjoy a comfortable stay. 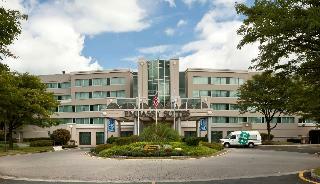 This hotel is strategically located in Parsippany, surrounded by major corporations. The hotel is situated close to many historical and cultural attractions. Lying only a 35 minutes' driving distance from Newark International Airport, this hotel is perfect for every type of traveller. New York City, with its bright lights and intriguing attractions, is located just a 30 minutes' driving distance from this hotel. Guests can enjoy shopping at the nearby Rockaway shopping centre, Jersey Gardens and the Willowbrook Centre. Lake Hopatcong offers a host of exciting activities. This wonderful hotel enjoys an attractive architectural design. The guest rooms are elegantly appointed, blending contemporary chic with classical style. The hotel's extensive array of facilities and services ensure convenience for every type of traveller.